The disappearance of dissident Saudi journalist Jamal Khashoggi while he was visiting the Saudi consulate in Istanbul, and Turkey’s allegation that he was killed, is the latest challenge for Turkey’s President Recep Tayyip Erdogan. He now has to make a decision: He can either stick to the narrative leaked by Turkish officials who say that Khashoggi was killed in the Saudi consulate and risk a major crisis with Riyadh, or he can pursue a less aggressive approach, as he has done in the past, in order to avoid putting relations with Riyadh under further strain. It will be a tough decision. Erdogan already has a lot on his plate. Turkey is at the center of an economic storm and has very few friends to turn to for help. Ankara-Washington relations are at an all-time low. Turkey-Russia relations are vulnerable and relations with Europeans are complicated. To avoid further problems, Turkey has been trying hard not to further strain ties with Saudi Arabia. The relationship has already been tense. Problems started when Erdogan became a leading critic of the 2013 coup in Egypt that toppled Erdogan’s close ally, Mohammed Morsi. Ankara blamed Riyadh for the coup. Turkey’s support for the Muslim Brotherhood, considered a terrorist organization by Saudi Arabia, angered the Saudis. Turkey’s siding with Qatar after the Gulf countries and Egypt cut ties with Doha, as well as Ankara’s cooperation with Tehran in Syria, spelled more trouble for Turkish-Saudi ties. More recently, Saudi Arabia announced that it had contributed $100 million to northeastern Syria for “stabilization projects” in areas held by Turkey’s archenemy, the Kurdish-led Syrian Democratic Forces (SDF). The SDF is dominated by groups close to the Kurdistan Workers’ Party, or PKK, which has been waging a war against Turkey since the 1980s. Turkey has become increasingly uncomfortable with Saudi Crown Prince Mohammed bin Salman. 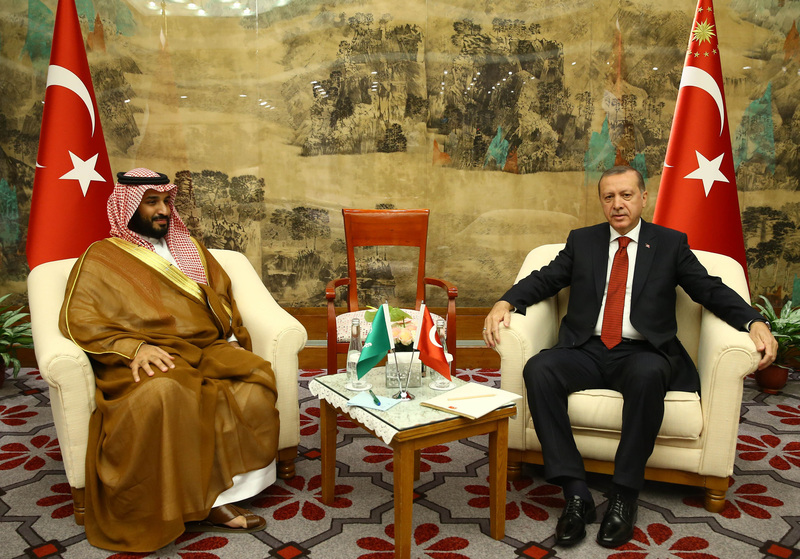 Ankara sees the crown prince as a U.S. pawn and the U.S.-Israel-Saudi axis as a threat against its regional clout. Yet Erdogan has largely refrained from openly confronting Riyadh. Even at the height of the Qatar crisis, Erdogan stayed clear of criticizing the Saudi leadership directly; soon after it dispatched a small contingent of troops to Qatar following the economic blockade, Ankara assured Gulf nations that its troops were no threat to the region. While lashing out at the U.S. for its support for the SDF, Erdogan remained mute after Saudi Arabia announced that it would provide support for SDF-held areas and after reports that Saudi officials had met with top PKK figures in Syria. Neither has he raised his voice against Riyadh’s war in Yemen. Economic considerations play an important role in Erdogan’s reluctance to escalate tensions with Riyadh. Erdogan saw Riyadh as an important actor in his efforts to reduce Turkey’s dependence on European investment. The two countries enjoyed close economic ties under his rule. Saudi Arabia has become a major investor in Turkey and Saudis are among the top foreign buyers of Turkish real estate. Turkey is interested in building the kingdom’s infrastructure, including airports and houses for low-income families. The economic cooperation between the two is all the more important now that Turkey is struggling with economic problems. The Khashoggi incident threatens to spark a major crisis between the two countries, and potentially between Turkey and Saudi Arabia’s Gulf allies, putting much-needed Gulf investment at risk. Initial reactions from Ankara suggest Turkey will not look the other way. Erdogan said that he was personally following the case and that Saudi officials could not salvage themselves by simply claiming the journalist left the premises, but would have to prove it with video footage. Yasin Aktay, an adviser to Erdogan, wrote in an Oct. 6 column that the alleged Saudi operation against Khashoggi was also an operation against Turkey. Pro-government circles have urged the government to hold the Saudis accountable for breaching Turkey’s sovereignty and assure the many Arab dissidents who have taken refuge in Turkey that they are safe. This is a tough decision for Erdogan to make at a time when he has economic problems at home and few friends left in the world. October is a particularly bad month for Turkey’s strongman. On Oct. 12, a Turkish court will decide the fate of the American pastor who has been jailed in Turkey for nearly two years on terrorism charges. His case sent Turkey-U.S. relations to an all-time low after President Donald Trump slapped sanctions against two Turkish officials for their role in the pastor’s imprisonment. If the court decides to keep him in prison, Turkey could face further U.S. sanctions. Oct. 15 is another important deadline. Turkey and Russia recently signed a deal to stave off an assault on Syria’s last opposition bastion, Idlib. As part of the deal, Turkey has pledged to ensure radical groups are removed from the agreed buffer zone. It is a difficult task. If Turkey fails to deliver, Turkey-Russia relations might come under strain. Erdogan has to make a decision on whether to escalate tensions with Riyadh against this backdrop. Turkish officials have said that investigators have “concrete proof” of the killing. If Erdogan chooses to make that evidence public, the Turkish government will have to consider its next move, which could include expulsions of Saudi diplomats, the consul general, or even the ambassador. But Erdogan may very well choose not to. That would deal another blow to Turkey’s already tarnished image as the world’s top jailer of journalists and would make Erdogan look weak domestically. An inflection point is rapidly approaching in Turkish foreign policy. How Erdogan will navigate this minefield remains to be seen.